Are you worried about where to enroll this coming semester? How about exploring your overseas options for study? Gain life skills – Live independently. Be well-travelled and street smart! There is still time for July and September intakes! School applications up to visa can be done in 3 months or less in some countries like Australia, Canada, New Zealand, Singapore, and UK . Wondering how to start? Attend AUG Philippines’ Go! 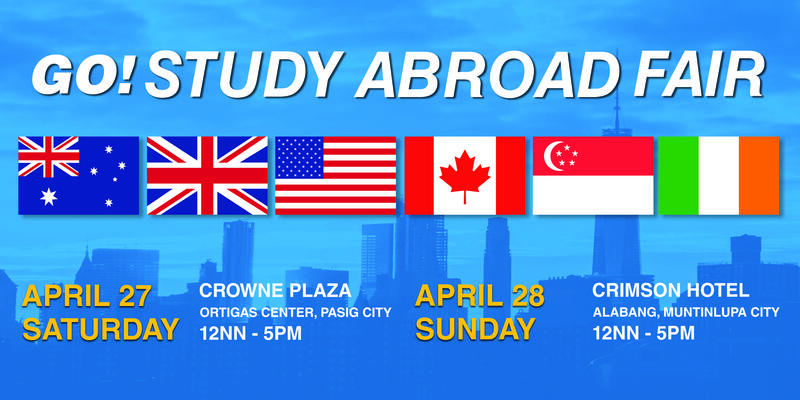 Study Abroad Fair to be held this April 27, 2019 at Crown Plaza Hotel, Ortigas and April 28, 2019 at Crimson Hotel, Alabang. Get the chance to speak to different university representatives to know your chances in getting accepted. You can also apply on the day! Don’t forget to bring the following: Transcript, Diplomas, CV and Passport; submit an application on the day and amazing prizes surely awaits you! For more inquiries, & questions, maximize AUG’s free services by contacting us at manila@augstudy.com or (02) 535 7711; (02) 534 2190!